Although many toxins and neurological insults that damage the basal ganglia and/or the substantia nigra result in neurological disorders which include parkinsonian features, one toxin, 1-methyl-4-phenyl-1,2,3,6-tetrahydropyridine ( MPTP ), appears to target relatively specifically those neurons that are involved in Parkinson's disease . The discovery of this compound, supports the enviromental toxin hypothesis about Parkinson's disease (PD). This hypothesis suggests that PD could be produced by chronic neurotoxin exposure or by limited exposure in the environment, initiating a self-perpetuating cascade of deleterious events. Infact , the finding that people intoxicated with MPTP develop a syndrome nearly identical to PD is a prototypic example of how an exogenous toxin can mimic the clinical and pathological features of PD. MPTP has been used also to develop ** animal models** for testing new therapies in the human disease. Up to date , MPTP treated primates are the best model for studying PD, although the symptoms do not accurately correspond to the idiopathic condition. Indeed, the specifity of MPTP as a toxin for dopaminergic neurons in apparently species-specific. Parkinson's disease (PD) is the second commonest neurodegenerative disease, exceeded only by Alzheimer's disease (AD). It is estimated that approximately 1 million persons in the United States and 5 million persons in the world suffer from this disorder. Clinically, PD is characterized by rest tremor, rigidity, bradykinesia, and gait impairment, known as the "cardinal features" of the disease. Additional features can include freezing of gait, postural instability, speech difficulty, autonomic disturbances, sensory alterations, mood disorders, sleep dysfunction, cognitive impairment, and dementia , all known as nondopaminergic features because they do not fully respond to dopaminergic therapy. Pathologically, the hallmark features of PD are degeneration of dopaminergic neurons in the substantia nigra pars compacta (SNc), reduced striatal dopamine, and intracytoplasmic proteinaceous inclusions known as Lewy bodies. In 2010, in Italy, the “ Dipartimento Politiche Antidroga”, identified MPTP as a new drug. MPTP, which is lipid-soluble, readily penetrates the blood—brain barrier and enters the brain cells. Because it is amphiphilic, it is captured into acidic organelles, mostly lysosomes, of astrocytes. MPTP itself does not appear to be toxic, but its oxidized product, 1-methyl-4-phenylpyridinium ( MPP+ ), is toxic. The initial oxidation of MPTP results in the formation of a dihydropyridinium intermediate MPDP+ (1- methyl-4-phenyl-2,3-dihydropyridinium) which may then be oxidized, by the further action of ** MAO** or non-enzymically, to give the toxic metabolite MPP+ (1-methyl-4-phenyl-pyridine). MPTP oxidation is operated by MAO-B. MAO-A, instead, doesn't play an important role in this reaction. This it has been elucidated with inhibitors of MAO-B, which give a protection against the effects of toxification of MPTP. Instead inhibitors of MAO-A show lack of protection on dopaminergic neurons. Other compounds as the des-methyl derivative of MPP+, 4phenylpyridine ( 4-PP+), converge in the same methabolic way of MPP+ production. 4-PP+ occurs in widely used spices and industrial emissions. The observation that N-methyltransferases from the brains of several species, including man and monkey, methylate C phenylpyridinium (4-PP+) to MPP+ raises the possibility that prolonged exposure to 4PP+ may contribute to the slow development of parkinsonism. Although the precise mechanism underlying the mode of MPP+ toxicity is unknown, it has been suggested that the toxicity of MPP+ is dependent on a mitochondrial concentrating mechanism via selective uptake. Energy-driven mitochondrial uptake of MPP+ results in sufficiently high concentrations of the toxin to interfere with mitochondrial respiration. MPP+ acts on complex I, or NADH dehydrogenase (ubiquinone), an enzyme of the respiratory chains. It catalyzes the transfer of electrons from NADH to coenzyme Q (CoQ). The site appears to be at or near the region where several other agents, such as rotenone, act to block mitochondrial oxidation. Blockade of mitochondrial respiration has two cytotoxic consequences. First, it impairs ATP formation, resulting in the inhibition of energy-dependent processes such as ion transport. A recent study suggests that inhibition of complex I is not solely involved in eliciting cell death. Indeed, disruption of calcium ion homeostasis plays a vital role in MPP+ toxicity. This results in an elevation of intracellular Ca2+, leading to the activation of Ca2+-dependent enzymes, for example, protein kinase and calpains I and II ( CAPN1, CAPN2), nonlysosomal cysteine proteases, which disturbs the normal cell function, resulting in cellular damage. 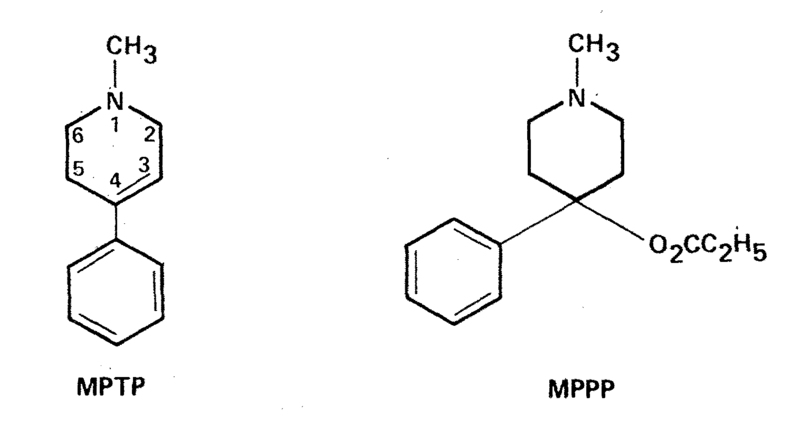 Second, MPP+ appears to support the occurrence of oxidative stress, due to the result of a redox reaction occuring between MPP+ and MPTP+.This view has received support from observations that administration of antioxidants partially prevented the loss of striatal dopamine in mice treated with MPTP , whereas the superoxide dismutase inhibitor diethyl-dithiocarbamate potentiated the effects. This notion is demonstrated by the generation of reactive oxygen radicals (ROS) and free iron. MPP+ and mitochondrial NADH dehydrogenase have been suggested to yield toxic hydroxyl radicals derived from hydrogen peroxide. In monkeys, MPP+ has been shown to release toxic iron (II) (Fe2+), which in turn may react with hydrogen peroxide via the Fenton reaction and, thus, yield hydroxyl radicals (•OH). Hydroxyl and other free radical species and Fe2+ have been strongly implicated in the pathogenesis of Parkinson's disease. More importantly, MPTP mimics another fundamental nigral biochemical change in Parkinson's disease, that is, a reduction of glutathione content, as observed in rodents. After MPTP cross blood-brain-barrier, its oxidation must take place outside the dopaminergic terminals, such as glia cells, because MAO-B activity is essentially absent from nigro-striatal dopaminergic nerve terminals. MPP+ must be exportated outside glia and uptake by dopaminergic terminals. 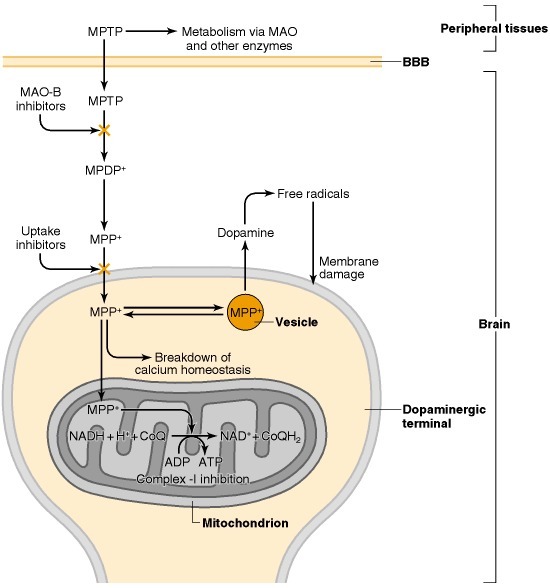 Active uptake of MPP+ into dopaminergic nerve endings results in sufficient concentrations to cause sustained inhibition of mitochondrial NADH oxidation, which ultimately leads to nerve cell death. Other classes of nerve terminals are less susceptible because MPP+ is not such an effective substrate for their specific uptake systems. The role of neuromelanin is also important, because MPP+ binds neuromelanin which is present in relatively high concentrations in the pigmented nerve terminals of the nigrostriatal region . It has been suggested that this binding may contribute to the specific concentration of MPP+ in dopaminergic neurones. Neuromelanin indeed could act as a buffer, maintaining the free concentrations of this toxin at sufficiently sustained levels to result in prolonged mitochondrial inhibition. Neuromelanin may also play a role in the formation of MPP+ since it has been shown to be capable of catalyzing the conversion of MPDP+ to MPP+. it. However, alternative pathways of MPTP metabolism occur in the liver and this may contribute to the peripheral resistance to the toxicity of this compound. In this context, it has been shown that administration of concentrations of pargyline which are sufficiently high to inhibit the microsomal cytochrome P-450 system potentiates the neurotoxic effects of MPP+. The parkinsonian syndrome induced by MPTP in man is clinically quite similar to idiopathic Parkinson’s disease. However, MPTP is an acute toxin, a single dose of which is capable of causing sufficient destruction of dopaminergic neurons to result in frank Parkinsonism. In contrast, the idiopathic disease develops relatively slowly and usually with late onset. Although chronic, but apparently not acute, treatment with MPTP results in the appearance of inclusion bodies resembling Lewy bodies present in the brain of some parkinsonian subjects, there are significant differences in the patterns of neurodegeneration. the case following MPTP treatment. any accelerated dopaminergic degeneration following the initial acute toxicity of MPTP. This shows MPTP has acute effects, only with large amounts. Infact, small amounts of this compound do not cause accellerated dopaminergic degeneration. The discovery of MPTP-induced PD and subsequent research exploring the molecular basis of MPTP-induced neurodegeneration established relationships between mitochondrial function, oxidative stress, and neurodegeneration. Moreover, animal MPTP treated models are essential at present to develop new therapies for Parkinsonism.